Like a lot of us, I like knowing how my equipment works, and why. What makes certain streamers swim the way they do. Why various lines perform better and worse in different temperature conditions. Last year I took up rod building in order to get a better sense of the decisions that go into making a rod (I also learned that I much prefer fly tying). But, despite having worn some type of corrective lens since I was ten years old, I never looked too closely into lenses. With my steelhead rivers being frozen over bank to bank, I figured it was time to make that change. I decided to get an education on glass by speaking to Peter Crow at Smith Optics. I wanted to learn how some of my favorite glass worked—what it did, exactly, and how. By the end of the conversation I had come to the conclusion that the word “sunglasses” was antiquated beyond retrieval. What we should really call those things on our face is an LMS—a light management system. MC: One of the trends over the last few years has been the arrival of low-light polarized lenses. What’s the challenge behind the making of this type of glass? And why not, say, a totally clear, untinted polarized lens? PC: Everyone has always asked for clear polarized lenses. The reality is this: it can’t be done. Polarizing film has to have some type of tint in order for it to work. The question has always been, how much? At Smith, we’ve spent years on the technology that has resulted in our Low Light Ignitors, a polarized low-light lens with a 40% visible light transmission rate. To provide a bit of context: your average pair of sunlasses transmits 14% of visible light. To me, as a fly angler, that was a problem. These sunglasses were born out of my own personal need for a lens that performed exceptionally well in low light situations. Because the reality is that there’s superb fishing early and late in the day—first light and last. Most lenses filter out too much light for low-light applications. To an angler, this meant that you fished the best light of the day without a pair of polarized lenses. To fish without an essential tool at the best time of day was unacceptable to me. That’s precisely the time you don’t want to be making compromises. You cant to maximize your advantage. These lenses were developed exclusively for the fly fishing community. It’s a niche lens in the world of lenses, but it’s low light is not a niche application: low light is fishing light. MC: I’m guessing the yellow tint plays a role? Smith Low Light Ignitor lenses – the 40% light-transmission-rate advantage. PC: Well, we found the best color for a low light lens is a mild yellow tint. It actually gathers a bit of light. This is the lens that I wear steelheading early and late in the day during the summer, and it’s the lens I wear all fall and winter–all day, everyday–unless it’s an absolutely bright day. In North America, once you get into October and November, the sun is lower in the sky. This is absolutely the best low light lens that there is. MC: Can you walk us through the anatomy of a polarized lens? What’s the history behind what’s being done at the moment? PC: Historically, polarized lenses emerged from a complex lamination process: there was a front wafer and a back wafer to the lens, and in the middle was a polarized polyvinyl-alcohol film. These layers were held together by optical glues that are very, very clear. It was a complex system. But we now use technology that goes above and beyond the lamination process. Our newest lens technology, ChromaPop, exemplifies the above and beyond. It doesn’t use polarizing film to polarize—there’s no lamination. Rather, it’s a treatment given to the lens, which, because that treatment is distributed evenly throughout the lens, can never become unlaminated. In a laminated lens, everything that’s “put together” can technically become “un-put together”; if you’ve owned cheap lenses you know what I’m talking about. And so with our ChromaPop lenses, there’s no optical haze introduced by layers of polarizing film or the optical glues that hold these laminations layers together. So it’s both exceptionally, exceptionally clear and very light. It’s not glass, and it’s not polycarbonate. It’s actually 10 percent lighter than polycarbonate, 50 percent lighter than CR 39. Chromapop’s filtering of light where the color wavelengths cross eliminates eye “confusion,” says Crow. MC: The thing that strikes everyone most about these lenses is their transmission of color and contrast. Can you explain the science behind that process of transmission? PC: To answer that question, I first have to explain how light travels. All visible light comes in three different colors: blue, green, and red. Each of these colors travels at different wavelengths, and these wavelengths cross over each other at a couple different points. Blue and green, for instance, cross over at 480 nanometers. Green and red do so at 580 nm. Where they cross creates visual confusion for the eye. What our lens technology does is filter out the light at 480 and 580 nanometers. By eliminating light wavelengths that the eye and brain have a difficult time parsing, we are essentially making color more vivid, contrast more distinct, clarity more apparent—all of which have very real applications for the angler. My takeaway from this conversation? Well, I realized the degree to which the sport of fly fishing is, and always has been, about the process of visualization, the act of making sense of light. Light passes through sunglasses, through deer hair wings, though camera lenses, through your favorite river’s surface film—with distortions and contortions alike. One of the things that has always struck me is how we anglers respond to stunning distributions of light in the form of a photo not too much differently from how trout respond to the gliding constellation of a just-shucked baetis (or its imitation). We all live in worlds of light patterns. Paying better attention to light—and understanding available light management systems—is not only something that can make you a more efficient angler, it’s also something we have in common with our quarry—it sure isn’t our smell or our sense of feel. 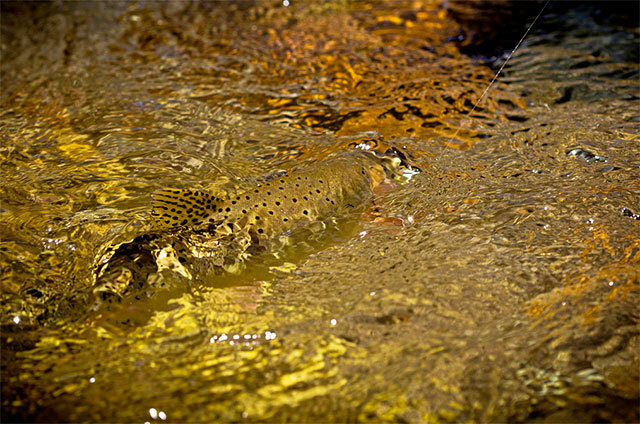 Whenever I watch a trout go airborne after a caddis sputtering a good foot above the water I wonder about their own, natural lens technologies and wonder: can I see as well looking down into their world as they can looking up into mine? In this modern era of brilliant lens technology, that answer might be inching closer to yes.